In Germany there are 5000, worldwide our beautiful timber is seasoned down to final moisture content in 150.000 timber dry kilns. And almost only in conventional timber dry kilns. In doing so the crucial disadvantages are the high use of energy and a low efficiency due to constant air exchange with the ambience. Up to 50% (!) of the applied heating energy is lost. Correspondingly high are the climate damaging carbon dioxide (CO2) emissions. Often we appease ourselves: „I have a waste wood boiler. The green house gases released were already compensated during the growth of the trees.“ That is right but please do not forget the energies from outside added to this circle (boiler manufacturing, pelletisation, transport). And moreover: Our common climate problem is caused due to the fact that more CO2 is released than our „still“ blue planet can absorb. This deficit in the ecological point balance we can only reduce by decreasing the emissions ore increasing the CO2 storages (these storages absorb green house gases. Forrets for example are carbon storages). 150.000 timber dry kilns worldwide create 40 million tons (!) of carbon dioxoide per year. Would they work with the new environmental friendly drying technology the operators would not only safe a lot of money but additionally a pollution comparable with 3 million cars or 2.7 million house holds per year could be prevented. The HILDEBRAND Initiative builds on the excitement and the unfettered approbation to protect our environment of all involved in the fields of operators, researchers and manufacturers. 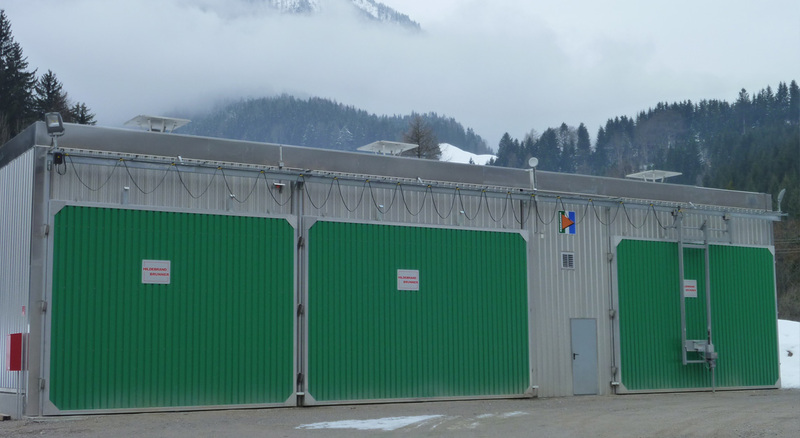 100% guaranteed as „green timber drying“ contributes to saving energy without the usual prior additional investments with very long amortisation times. From day 1 on it is easy on your wallet and your economical conscience with 15-25% energy savings and CO2 reduction. The HILDEBRAND Initiative hepls to achieve the ambitious climate aims of our gouvernments. 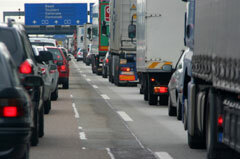 Moreover you can use the advantages of the world wide carbon dioxide trade. Conclusion: Green is the hope of us all. Green is a symbolic colour. We can simply not afford energy waste and the subsequent pollution anymore. 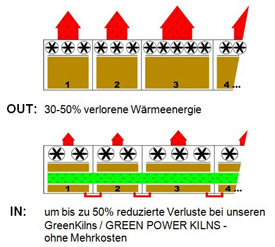 With the HILDEBRAND GreenKilns® the valuable energy is not simply extruded out the exhaust vent – i.e. chimney. It stays in the system to the benefit of you and all of us. The Heat Recovery (heat exchanger) unit with this new drying system is inside. You do not see – they do not caulk – they are for free. Promised! Advice: external Heat Recovery units or heat exchangers (mounted on the roof) lose their efficiency by the years due to wood dust and other deposits like for example resin. The fresh-/ and exhaused vents which work synchronic in the conventional drying system are now decoupled. 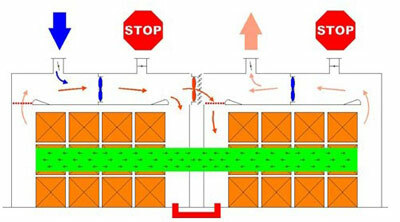 This way the HILDEBRAND GreenKilns® for the first time avoid the problem of „dead heat“ without additional costs. The airflow is heated up after it exits the timber stack. Fresh air adds from the ambient. Behind the fans an already warm air flow exits the exhaust vetns without any performance in the kiln system. This is what we call „dead heat“ and this is impossible to place in our times. Advice: in conventional kiln systems you can avoid that problem only by placing the heat exchangers in the back and fron apron (each with 100% performance and additional valve) – this means substantial invetsments due to doubled heating capacity etc. With the HILDEBARND GreenKilns® climatic suitable kilns are thermically coupled and it goes without saying that they avoid the „dead heat“. This way you do not only save energy – we help our environment! This savings in heating energy you do not get with external heat recovery units – it only works with our HILDEBRAND GreenKilns®. In conventional dry kilns this valuable „reservoir heat“ is lost to the environment – this as well we can not nafford anymore. 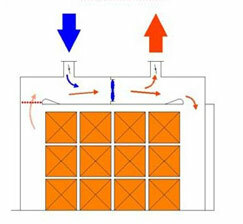 Advice: With external heat recovery units for example on the roof the „reservoir heat“ is totally lost as well. Furthermore the cooling down process is extended (without side vent).